How do you figure out what's the right mix of skills for the co-founders of your startup? 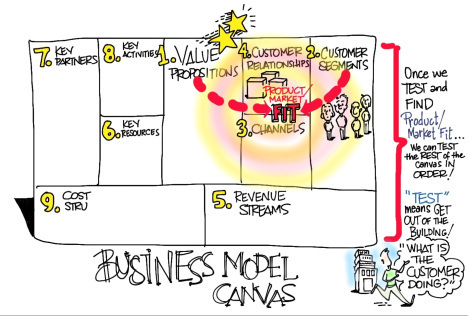 Surprisingly if you've filled out the business model canvas you already know who you need. I was having breakfast with Radhika, an ex-grad student of mine who wanted to share her Customer Discovery progress for her consumer hardware startup. She started by sketching her business model canvas on a napkin, but somehow the conversation quickly shifted to what was really on her mind. "After reading your post on Why Founders Should Know How to Code it looks like web/mobile startups have it easy. They seem to know the right mix of skills on their founding team is a hacker, hustler and designer. But what about for us, a consumer hardware hardware company? Trying to figure out what the right set of co-founders isn't so clear. How do I decide who I need to have on board on day one? Who can I hire later? And what can I outsource?" I told Radhika this is a perennial question for startups. I had struggled with this one for years. And over time every venture capitalist develops their own gut feel for what makes up a great team in their industry. I said, "If you've filled out the business model canvas you already know who you need on your founding team, the answer is staring us in the face." 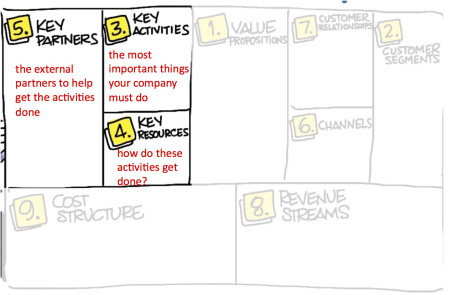 One of the virtues of using the Business Model Canvas as part of a Lean Startup is that it helps you frame each one of your nine critical hypotheses. While most of the early attention in a startup is paid to finding product market fit (the match between value proposition and customer segment on the right-side of the canvas) it's the left side of the canvas that will tell you what your founding team should look like. For example, if you're building a mobile app, then the key activities are: app software development, user interface design and demand creation skills. Or if you're building consumer electronics the key activities might be: low cost hardware design, high volume manufacturing, user interface design, consumer branding and retail distribution. For medical devices it might be mechanical engineering, clinical trials, regulatory approval, freedom to operate (intellectual property) and figuring out a reimbursement strategy. So What Does this Have to Do With A Founding Team? For example, in web and mobile apps most of the resources needed at first are people: a developer (the hacker), a user interface designer, and someone to lead the team and create customer demand and if needed raise capital (the hustler). In medical device startups these resources are expertise in the basic science, industrial design, human factors, managing Contract Research Organizations, reimbursement, Intellectual Property, and someone to lead the team and raise capital and establish strategic partnerships. Therefore the ideal medical device team might be a physician; engineer; operator; business development/financial analyst. Are We Missing A Founder? Once you've figured out the activities and resources, you can then ask, "If these activities are crucial in building our company and these resources are the critical people skills need to make them happen. Does anyone on the founding team have these skills? Are we missing a founder? Or can we outsource these activities to Partners?" Radhika nodded. "I get it" she said, "understanding activities and resources help me identify and then prioritize the skill sets I'll need, but what about the individual characteristics of the individuals - resilience? tenacity? agility? team work? How much value should I put on co-founders I've worked with before?" I smiled and said, "Figure out what you need first, then we can have another coffee." Next, what human resources are necessary to make those activities happen? Can these skills be outsourced to partners or are they integral to the DNA of the company?